Today’s Final Jeopardy answer (in the category The U.S. Senate) and statistics for the Monday, February 4, 2019 game between Morgan Burns, Susan Campbell, and 1-day champion Will Dawson. 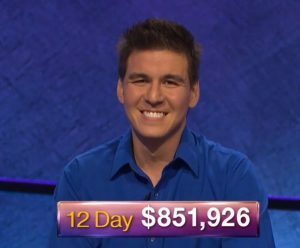 Recap of Jeopardy’s Encore Presentation match (THE U.S. SENATE) aired August 19, 2016, the 2016 College Tournament final (Game 2) between Sam Deutsch, Niki Peters, and Sarah Dubnik, originally aired February 12, 2016. Eric R. Backes qualified 90.450% of the time. Anneke Garcia qualified 69.585% of the time. Lindsey Shultz qualified 35.813% of the time. Dave Leffler qualified 8.942% of the time. Jonathan Dinerstein qualified 1.844% of the time.